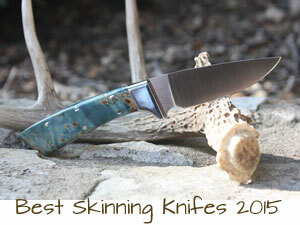 A high-quality skinning knife is a man’s best friend when hunting in the wilderness. These knives are a great tool to have at all times, regardless of the game you are hunting. While skinning knives are predominantly used to remove the hide from a game animal, they are incredibly versatile. Skinning knives can also be used as an all around utility knife. One of the biggest mistakes that hunters make in the wilderness is using a knife to skin animals that isn’t specifically designed for this purpose. While other knives may get the job done, a skinning knife is specially crafted to get the job done correctly. Skinning knifes tend to be lightweight, thin, and curved. While different manufacturers implement their own design features, there are a few things that all skinning knives have in common. 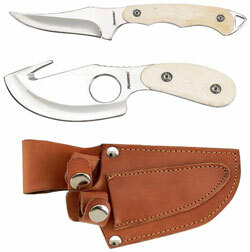 To aid in skinning, these knives have a curved blade that is relatively thin and pliable. This allows the blade to follow the contours of the meat without actually cutting into it. This makes separation of the hide a breeze. While it may seem daunting to find the perfect knife, all it takes is a bit of key knowledge to find the perfect knife for your needs. To help with your search, here are 5 of the best skinning knives of 2015. The 113 Ranger by Buck Knive is a fixed blade knife that is quite compact, measuring only 7 1/4 inches long. 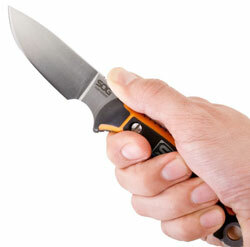 The skinning knife is also very light, weighing just over 5 ounces. For added convenience and protection, it comes with a sheath made of genuine leather. The actual blade is made from 420HC steel. It has a drop point shape, making it great for skinning. The sharp tip can be used to puncture the skin so that innards can be removed. The handle is made from walnut and brass. It has a rugged, outdoorsy feeling that any man can appreciate. There’s even a small hole in the handle so that a lanyard can be attached. Overall, this is a great skinning knife. It is compact, yet sharp enough to skin a variety of game. Priced around $42, the knife is incredibly affordable. It also comes with a forever warranty, ensuring that you’ll have it for many years to come. This is a great set from a trusted brand. The set comes with two separate knifes. Both knives are incredibly small and compact, measuring around 7 inches long. The Meyerco Mossberg MO2PCBN set is designed to provide you with all you’ll need to skin common game like rabbits and deer. One knife is thin and curved. It is ideal for skinning more difficult areas. It has a sharp point and ergonomic handle. The other knife has a gut hook. This knife is incredibly versatile. The hook will help you remove innards by puncturing the skin. There is even a handy finger hole in the middle of the blade to provide stability. The blade itself is quite broad, making it ideal for skinning larger game. Both knives have a unique bone handle that is tough, yet eye-catching. The included sheath is designed to keep both knives together so that they can be accessed in an instant. Priced under $40, this knife set is great for anyone who wants versatility. This fixed-blade knife by Benchmade is very durable and compact. It measures only 6 inches in length, making it incredibly easy to take on a hunt. It comes with a pressure-fit sheath that holds the knife snug. The handle is made from dymondwood, allowing it to withstand a lot of wear and tear without ruining the natural finish. The blade is made from S30V stainless steel. It is cut into a unique clip-point design. It actually has ridges on the top of the blade to cut through tougher materials. The rounded curve of the skinning edge is great for both big and small game. This skinning knife is at the higher end of the price spectrum at $130. However, you are getting a high quality knife from a trusted brand. Benchmade uses exceptional materials in their blades, making them highly sought after and recommended by experienced hunters. For those who want a knife that’s a bit larger, the Marttiini Skinner knife is a great option. It measures just under 9 inches long. It is made in Finland using high quality materials. The blade is made from 420 stainless steel. It has a broad curve that is designed for skinning. With the larger size, this knife can be used to skin a larger animal with ease. The handle is made from stained birch wood. It has a great natural appearance, making it a great choice for hunters. The handle also has the added protection of a stainless steel finger guard, ensuring that you are skinning safely. Priced at around $30, this is a great knife for hunters on a budget. While you are paying less money for the knife, you are still getting superior build and craftsmanship. It’s an all around great utility knife that can be used for a multitude of tasks, including skinning. The K700KXP from Columbia River Knife and Tool is designed for prolonged use. Unlike other knives on this list, the handle is double injection molded. It is textured to provide comfort while skinning. The blade is made from K110 stainless steel. It is strong and very easy to maintain. It is also quite wide, making it a great choice for skinning an animal with a lot of meat. The blade is carefully crafted with a slight convex grind near the tip. This allows you to slice without any drag. The knife is a great modern choice for hunters. Everything about the knife is carefully planned and crafted for easy skinning. At only $42, it is budget-friendly without skimping on quality. All of these knives are a great choice, regardless of your experience. However, there are a few things you may want to consider before choosing a knife. While all skinning knives tend to have the same basic design principles, different knife makers use different techniques to provide you with a unique skinning experience. Before purchasing a knife, you should consider how you’ll be using the knife to determine which features are right for you. Generally, skinning knives have a curved edge. This curve provides consistency when skinning. The main goal of skinning an animal is to remove the hide without damaging the meat. With a curved blade, you’ll be able to glide the knife between the skin and meat effortlessly. When purchasing a knife, you should consider the type of curve you want. Broader curves are great for larger animals with a lot of meat. A smaller curve may be better suited for smaller game.You may also consider getting a blade with a sharp tip or gut hook to help with the task of gut removal. Skinning blades are often made of steel. That being said, there are many different grades of steel. They all have different strengths, affecting the knife’s overall performance. When choosing a knife, you should ensure that the blade is thin, yet strong enough to withstand a lot of use. Blades need to have a bit of give to them. The ability to bend and curve around contours is what makes a skinning knife superb. While most hunters don’t think about the weight of their knife, it can actually have a huge effect. Heavier knives can become a hindrance when skinning. Not only are they more difficult to hold, but they can cause you to damage the meat. The added weight may cause you to take of a small layer of meat while you skin. Additionally, a heavier knife may be more difficult to carry in the wilderness. You should aim for a knife that is as light as possible. Skinning knives need to be portable. When you are out in the wilderness, it is impossible to hold onto a knife and your hunting gear at the same time. It is important to find a knife that can easily be tucked away when not in use. Folding knives are a great option. Alternatively, rugged sheathes can be used to protect the blade. Sheathes can easily attach to a belt buckle, ensuring that your knife is always at your size.